Large building fires are a relatively common occurrence in impoverished Bangladesh, due in part to lax regulations, and have killed hundreds in recent years. “So far, 56 bodies have been recovered. The number could rise further as searching is still continuing,” Julfikar Rahman, a director of the Fire Service and Civil Defence, told Reuters. 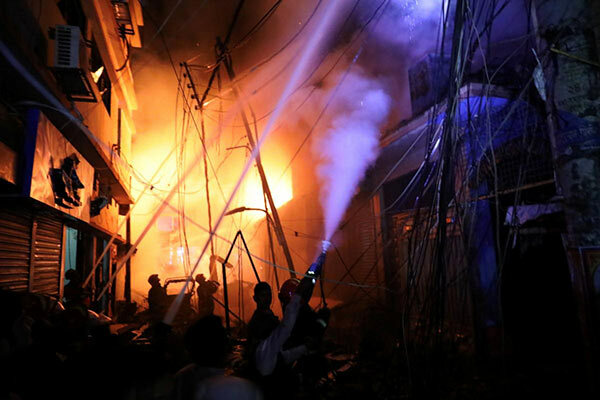 The fire broke out in a four-storey building on Wednesday night and quickly spread to nearby buildings in the Chawkbazar area of Old Dhaka, which dates back to the Mughal period more than 300 years ago. Rahman said at least 50 people had been taken to hospital, some in critical condition. Fire fighters fought for more than five hours to bring it under control, although it was still burning early on Thursday. It was not immediately clear what caused the blaze. The Dhaka Tribune reported that the building housed a plastics warehouse and was full of flammable material. “The cause of the fire is not yet clear,” Rahman said. He said firefighters struggled to find adequate water supplies and had to draw water from a nearby mosque to fight the blaze. Building safety regulations are rarely followed in Bangladesh, where accidents kill hundreds every year.